Maura discovered she had HIV in 1997 when she was pregnant with her first child. At that time, there were no services or programmes in place for people living with HIV: no anti-retroviral treatment (ART) or counselling was available. Maura saw people ostracized and die due to stigma and discrimination, including her baby and husband, so she felt she had to advocate for treatment and acceptance. Maura became the first woman to publicly disclose her HIV status in Papua New Guinea. Maura credits the Global Fund for saving her life. It funded her ART when it arrived in PNG in 2004. Maura has also had malaria and contracted tuberculosis (TB) in 2001 because of HIV. She accessed her malaria test and treatment at a Global Fund-funded clinic and still frequently receives tests and new mosquito nets. While her TB treatment was through a government-supported clinic, she has routine checks for TB via Global Fund-funded services. The Global Fund remains the only donor that funds community activities, while the government now funds Maura’s ART. 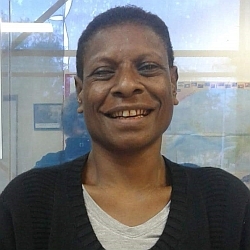 Maura is a trained nurse and a member of PNG’s Country Coordinating Mechanism representing PLHIV. She is involved in the decision-making of the country’s Global Fund programmes and funding. Maura is a member of Igat Hope, the national network of PLHIV. She is a member of the Steering Committee of Asia Pacific Activist Coalition for TB, the Asia Pacific Network of PLHIV (APN+) and the WHO Regional Green Light Commission of Western Pacific Region and a focal point for APCASO in PNG. Maura has worked with UN Women, AusAID, UNDP and several community organizations. The Global Fund has been in PNG since 2004. It currently supports 23,000 people on ARVs, has detected and treated 33,000 cases of TB and distributed 11,200,000 mosquito nets.